US empire is in decline. Reports of the end of the US being the unitary power in world affairs are common, as are predictions of the end of US empire. China surpassed the United States as the world economic leader according to Purchasing Power Parity Gross National Product, and Russia announced new weapons that can overcome the US’ defense systems. What is happening in the United States, in response, is to do more of what has been causing the decline. As the Pentagon outlined in its post-primacy report, the US’ plan is more money, more aggression and more surveillance. Congress voted nearly unanimously to give the Pentagon tens of billions more than it requested. Military spending will now consume 57% of federal discretionary spending, leaving less for basic necessities. The Trump administration’s new nominees to the State Department and CIA are a war hawk and a torturer. And the Democrat’s “Blue Wave” is composed of security state candidates. The US is escalating an arms race with Russia and China. This may create the mirror image of President Reagan forcing Russia to spend so much on its military that it aided in the break-up of the Soviet Union. The US economy cannot handle more military spending, worsening austerity when most people in the US are in financial distress. This is an urgent situation for all people in the world. In the US, we carry an extra burden as citizens of empire to do what we can to oppose US imperialism. We must be clear that it is time to end wars and other tools of regime change, to become a cooperative member of the world community and to prioritize the needs of people and protection of the planet. There are a number of opportunities to mobilize against US empire: the April 14-15 days of action, the Women’s March on the Pentagon in October and the mass protest planned against the military parade in November. This week, President Trump fired Secretary of State Tillerson, nominated CIA director Mike Pompeo for the State Department and chose Gina Haspel to replace Pompeo at the CIA. As we write this newsletter, National Security Adviser H.R. McMaster is on the verge of being fired [since been fired and replaced by uber-hawk John Bolton]. The deck chairs are being rearranged on the Titanic but this will not correct the course of a failing foreign policy. The Pompeo and Haspel nominations are controversial. Pompeo believes torturers are patriots. He is a war hawk on every conflict and competing country, including Russia and especially Iran. And, unlike Tillerson, who stood up to Trump on occasion, Pompeo kisses-up to Trump, defending his every move. Haspel led a CIA black site torture center and ordered destruction of evidence to obstruct torture investigations. The Democrat’s record on torture is not good. President Obama said he would not prosecute Bush era torturers, infamously saying, “we need to look forwards as opposed to looking backwards.” John Brennan who was complicit in Bush-era torture, withdrew under pressure from becoming CIA director in 2008, instead becoming Deputy National Security Adviser, which did not require confirmation. After Obama’s re-election, Brennan became Obama’s CIA director. Brennan was inconsistent on whether torture worked. He tried to elevate Haspel, but the controversy around her prevented it. When the CIA spied on the US Senate Intelligence committee over their torture report, Brennan originally lied, denying the spying, but was later forced to admit it. He was not held accountable by either the Democrats or Obama. Haspel headed a black site in Thailand where torture was carried out. She ordered the destruction of 92 secret tapes documenting torture even thoughthe Senate Judiciary requested the tapes, as had a federal judge in a criminal trial. According to a federal court order, the tapes should have been turned over to comply with a FOIA request. Counsel for the White House and CIAsaid the tapes should have been preserved. Haspel’s actions should lead to prosecution, not to a promotion as head of the agency, as CIA whistleblower John Kiriakou, who exposed torture and served time in prison for it, reminds us. The Trump nominations leave the Democrats on the cusp of a complete surrender on torture in an election year. Caving on torture by approving Pompeo and Haspel will anger Democratic voters and risk the high turnout need for their anticipated 2018 “Blue Wave”. Republican Senator Rand Paul says he will oppose both nominees. If all the Democrats oppose, the Senate will be split 50-50, requiring one more Republican to block the nominees. Fifteen Democrats supported Pompeo’s nomination as CIA director, so Democratic opposition is not ensured. 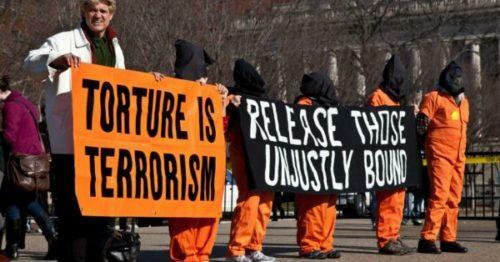 Will Democrats oppose torture or be complicit in normalizing torture? 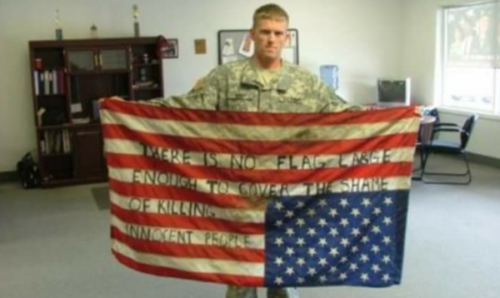 Militarism and war are bi-partisan. When Trump submitted a military budget, the Democrats almost unanimously joined with the Republicans to increase the budget by tens of billions of dollars. But, that is not all, a series of investigative reports by the World Socialist website reported the Democratic Party is becoming the party of military and intelligence candidates. The series identifies more than 50 military-intelligence candidates seeking the Democratic nomination in 102 districts identified by the Democratic Congressional Campaign Committee as targets for 2018. The result, as many as half of all new congressional Democrats could come from the national security apparatus. An example is the victory in Pennsylvania by Conor Lamb, an anti-abortion, pro-gun, pro-drug war, ex-Marine, which is being celebrated by Democrats. The Sanders-Democrats, working to make the Democratic Party a progressive people’s party, are being outflanked by the military-intelligence apparatus. In the end, Democratic Party leadership cares more about numbers than candidate’s policy positions. If on November 6 the Democratic Party makes the net gain of 24 seats needed to win control of the House of Representatives, former CIA agents, military commanders, and State Department officials will provide the margin of victory and hold the balance of power in Congress. The presence of so many representatives of the military-intelligence apparatus in the legislature is a situation without precedent in the history of the United States. Just as Freedom Caucus Tea Party representatives hold power in the Republican Party, the military-intelligence officials will become the powerhouse for Democrats. This takeover will make the Democrats even more militarist at a dangerous time when threats of war are on the rise and the country needs an opposition party that says ‘no’ to war. What does this mean? Kim Dotcom might be right when he tweeted, “The Deep State no longer wants to rely on unreliable puppets. They want to run politics directly now.” What does it mean politically? There is no two-party system on militarism and war. 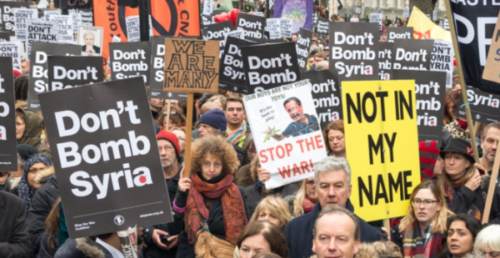 Those who oppose war are not represented and must build a political culture to oppose war at home and abroad. There is dangerous denial among US foreign policy elites about the Russian weapons systems announced by Putin in his state of the union speech last week. Military-intelligence analyst the Saker compares the US’ reaction to the five stages of grief: denial, anger, bargaining, depression, acceptance. US elites are in the first two stages. The US does not have an adequate defense to the weapons announced by Putin. As the Saker writes, “Not only does that mean that the entire ABM [Anti-Ballistic Missile] effort of the USA is now void and useless, but also that from now US aircraft carrier battle groups can only be used against small, defenseless, nations!” US leadership cannot believe that after spending trillions of dollars, Russia has outsmarted their military with ten percent of their budget. Former Secretary of Defense William Perry exemplifies this denial, claiming Putin’s weapons are “phony,” exaggerated and do not really exist. Then he blames the Russians for starting an arms race. Of course, in both the National Security Strategy and Nuclear Posture Review, published before the Putin speech, the US announced an arms race. US political and military leadership brought this on themselves. The US’ leaving the SALT treaty in 2002 and expanding NATO to cover the Russian border led to Russia’s development of these new weapons. Further, Obama, and now Trump, support spending more than a trillion dollars to upgrade nuclear weapons. Perry falsifies history and blames Russia rather than looking in the mirror, since he was defense secretary during this era of errors. The new Russian weapons systems do not have to lead to an unaffordable arms race. The US should re-evaluate its strategy and find a diplomatic path to a multi-polar world where the US does not waste money on militarism. We can divest from the military economy and convert it to civilian economic investment, as the US has many needs for infrastructure, energy transition, health care, education and more. The Russian end-goal is simple and obvious: to achieve a gradual and peaceful disintegration of the AngloZionist Empire combined with a gradual and peaceful replacement of a unipolar world ruled by one hegemon, by a multipolar world jointly administered by sovereign nations respectful of international law. Therefore, any catastrophic or violent outcomes are highly undesirable and must be avoided if at all possible. Patience and focus will be far more important in this war for the future of our planet than quick-fix reactions and hype. The ‘patient’ needs to be returned to reality one step at a time. Putin’s March 1st speech will go down in history as such a step, but many more such steps will be needed before the patient finally wakes up. As of now, the Pentagon and US leadership are in denial and not ready to face reality. The people of the United States, in solidarity with people of the world, must act now to end the war culture and convince US leadership that a new path is necessary.